An easy way to start your houseleek collection. The iconic houseleek is back! Be part of the succulent plant revolution. Supplied as a collection of 6 plants in 9cm pots. Sempervivums, the iconic houseleek, were the mainstay of 70's municipal borders and park displays, but today, they have worked their magic and are making a welcome return to our gardens, as people realise that they are a real multipurpose plant. Be part of this succulent revolution and buy your now - let yourself be won over by these fascinating, low-maintenance perennials. Sempervivums form rosettes of colourful, fleshy leaves and are low growing, making them extremely popular as a living carpet of green and an ideal candidate for green roofs and living walls - a welcome addition to any garden because of their colours and diversity of form. Also known as hen and chicks because the freely produced offsets gather around the mother plant in much the same way as chicks around a mother hen. 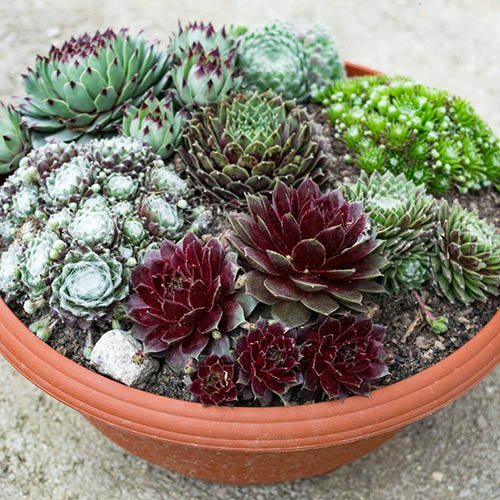 Sempervivums are drought tolerant and will take a roothold in the narrowest of cracks - hence their common name, as they were once used to plug gaps in leaking roofs. Recommended as an ideal plant to spearhead the need to adapt our gardens to be more responsive to climate change. This resurgence in popularity has been driven in part by their undemanding nature - they're very much a 'plant-it-and-leave-it' type of plant - easy to grow and a doddle to maintain, fully winter hardy and produce multiple new plants every year. As a bonus during the summer, the mature rosettes throw out spikes topped with star shaped flowers which insects love, plus they produce offsets, or new plants, every season that are simple to separate and grow as new specimens. Supplied as a collection of 6 named plants, 1 of each variety. Please note that varieties may change throughout the year, depending on availability. Suppled as six named plants in 9cm pots ready for planting straight out. Grow them in trays or pots, in the ground, or on wood or in rock piles. Once established, the plant’s need no further care.